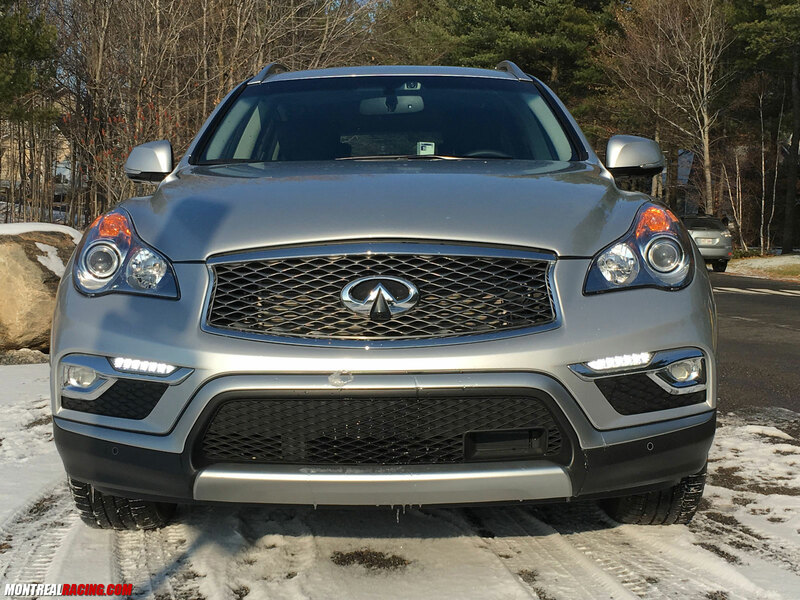 When I first heard about the new 2016 Infiniti QX50, I was excited to see what the brand had done in terms of styling. 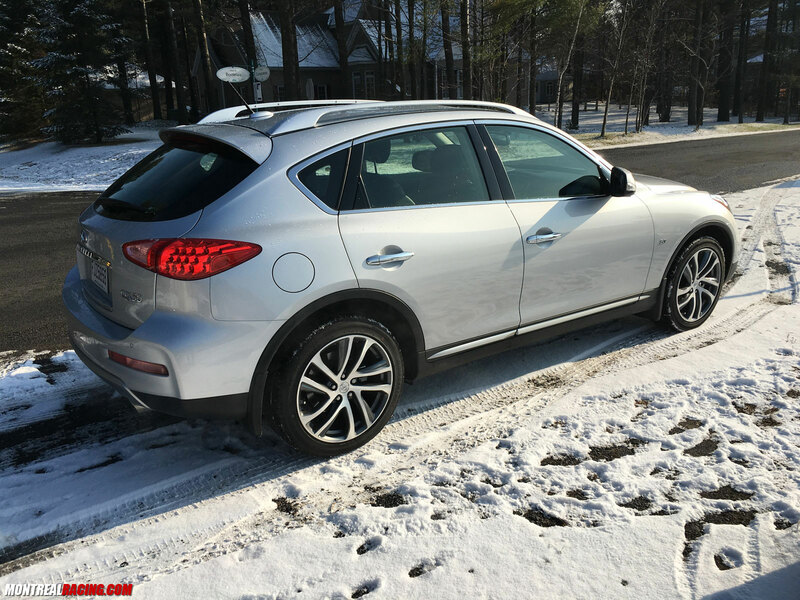 Nissan & Infiniti have been quite bold on the design front in recent years so my expectations were high for the model formerly known as the EX35/EX37 and introduced in 2008. 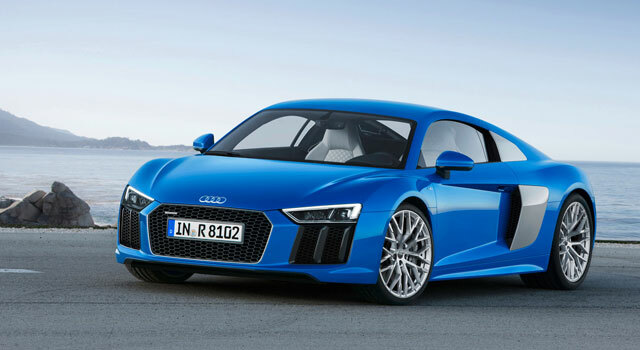 My hopes were brought back down to Earth after seeing that the 2016 would very much resemble the 2015 model. I could discern a different front grille and front bumper but that’s about it. 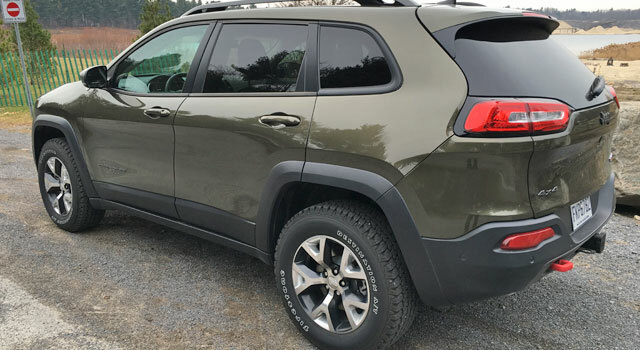 I will lament that the average Joe like me has limited knowledge as to the inner-workings, politics, mechanics and fine details involved in bringing a vehicle to market. 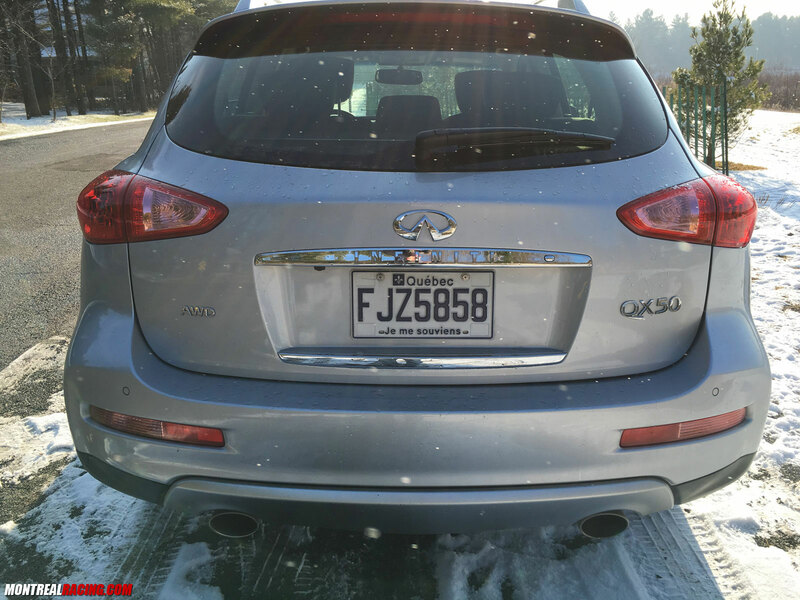 I’m sure there are good reasons as to why the current generation QX50 was extended for another year. I simply dislike the “new’ moniker associated with something unless it is, in fact all-new. 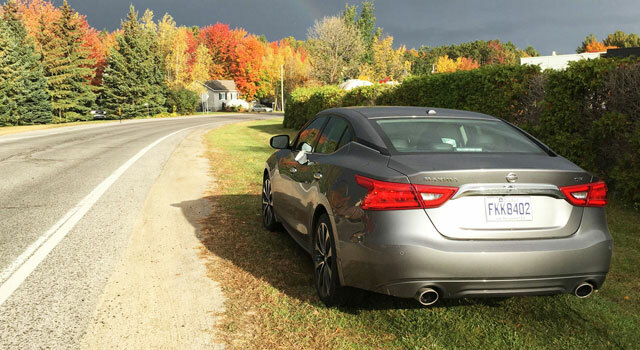 The changes come amid Infiniti lagging behind the Acura RSX and Lexus NX in terms of sales. The main complaint from the previous model that was addressed was the lack of rear leg room. 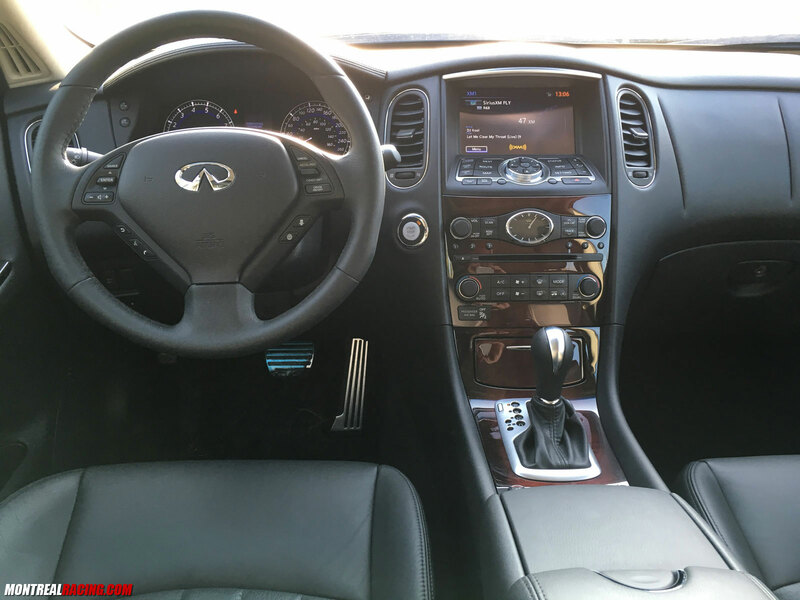 Infiniti stretched the QX50 wheelbase 4.5 inches in order to increase the interior space. Adults can now sit comfortably in the rear seats where they had trouble doing so before. The interior remains much the same as it was before but don’t forget this vehicle first came out in late 2007 as a 2008 model so it’s a bit dated as interiors go. The one new feature is a very handy power-folding rear seat. 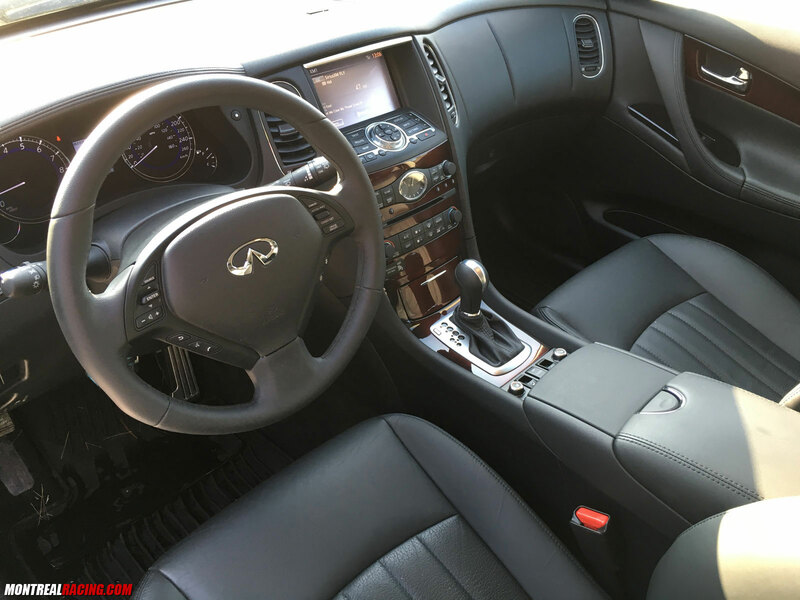 That being said, Nissan & Infiniti interior finish is among the best I’ve seen. Under the hood is where the QX50 packs a punch with the powerful 3.7-litre 325 horsepower V6 motor. 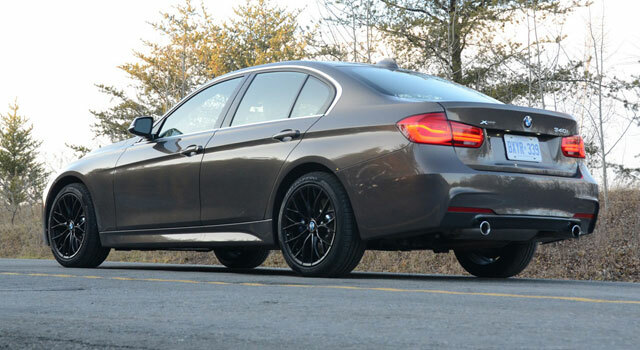 It bests the competition handedly in the performance department but at a price of lower fuel efficiency. I averaged 12.5L/100km in the week with the crossover. All that power gives a “beasty” sensation as if the vehicle is larger than it actually is which I loved. 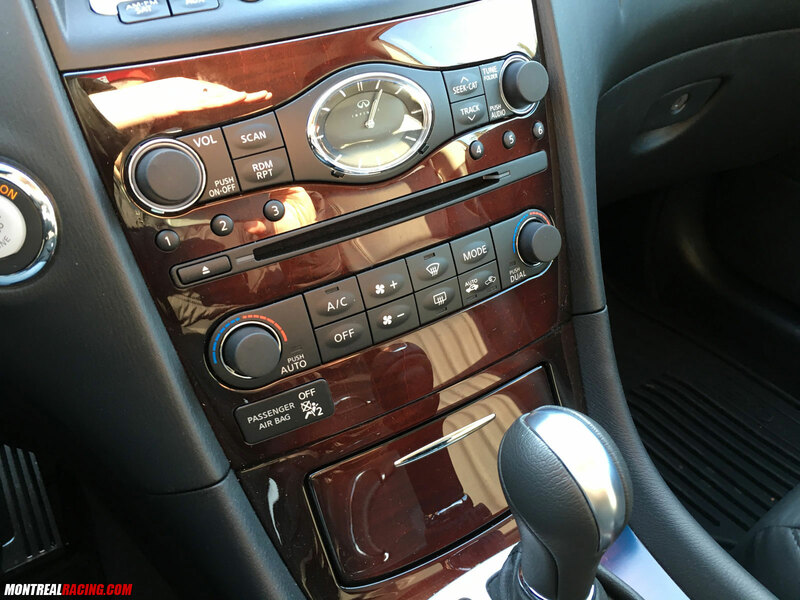 The drive in the QX50 is smooth but still very sporty. The dimensions allow for easy parking at the supermarket but I still felt like I was driving some sort of truck rather than a wagon. Infiniti seems to have gotten that formula right where some manufacturers have crate crossovers that are none other but uncool station wagons. 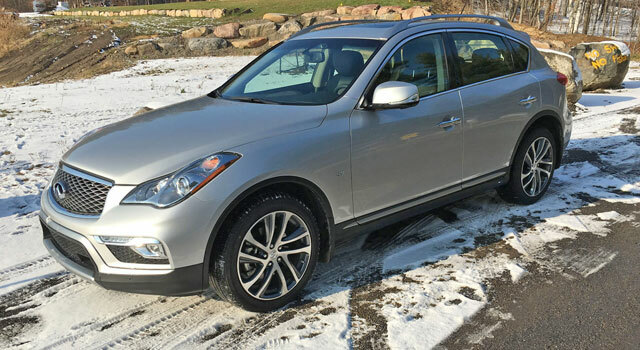 This QX50 came with the tech package which includes something called Intelligent Brake Assist with Forward Collision Warning. If the system detects that you may be about to hit another vehicle it will apply the brakes for you. It came on several times when I didn’t want it to but maybe that’s an indication that my driving habits need revisiting. 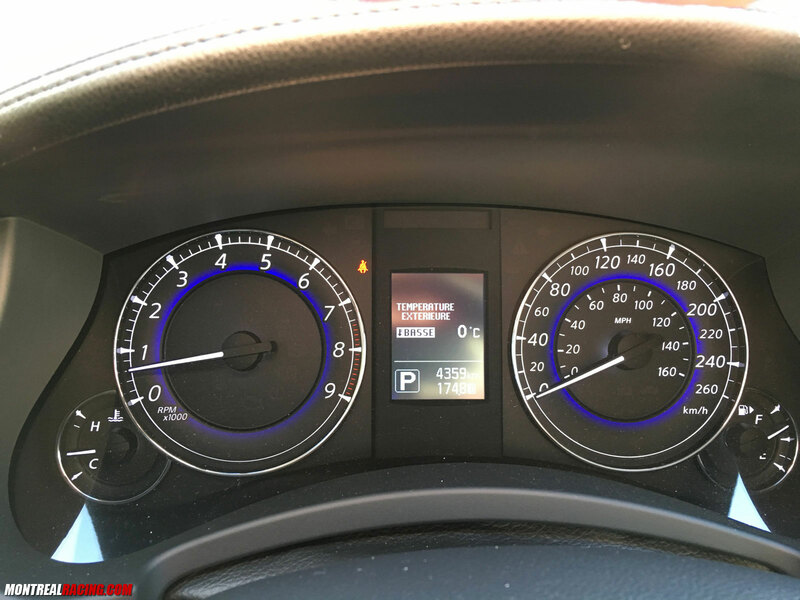 Other features in the tech package include Intelligent Cruise Control, Blind Spot Warning System, Distance Control Assist, Lane Departure Warning, and Lane Departure Prevention. 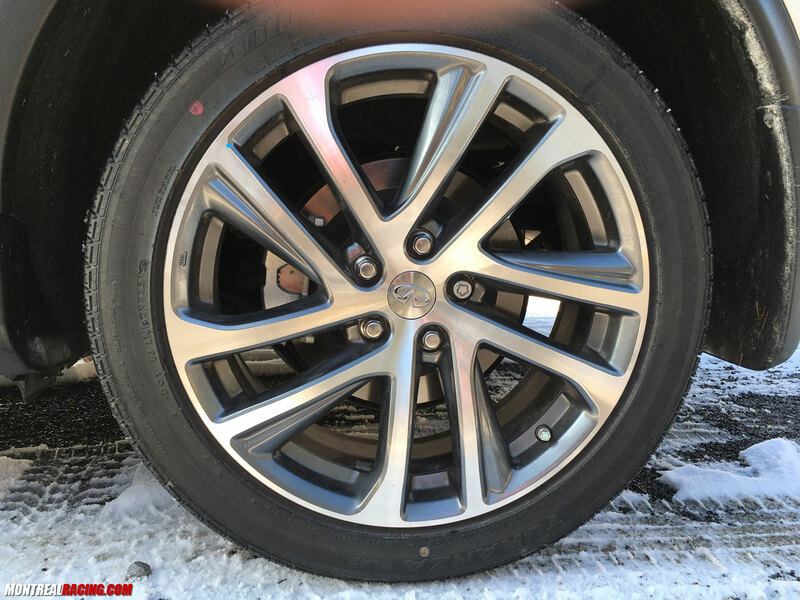 The $39,995 starting price is the least expensive compared to offerings form Acura and Lexus. 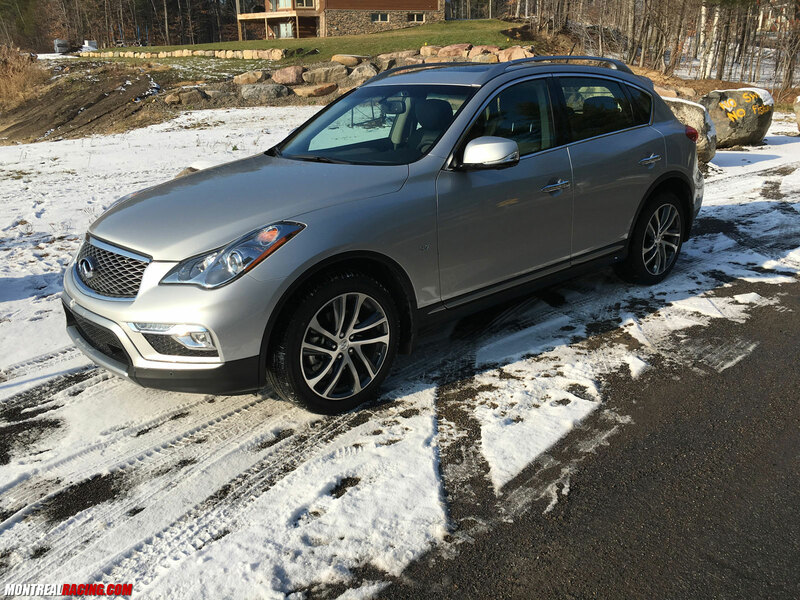 If you’re in the market for a new crossover be sure to drive the QX50. It remains somewhat of a grandfather in the segment but it’s a vehicle that just works well has had all the kinks worked out of it.